Jussie Smollett leaves a Chicago courthouse Tuesday, shortly after prosecutors dropped all charges against him. The move was met with anger from local authorities and confusion from plenty of onlookers. Now, as the dust settles, you may have some questions. Well, here are some answers — as well as some notes on what we don't have answers to at the moment. Here's a timeline of major dates in the case, by the way, in case you're fuzzy on those, too. Click on a question below to jump to its answer, or simply scroll down. Why did prosecutors drop the charges? Just how common is this kind of thing? Why are Chicago's authorities upset? Is the case really over? The actor, who is black and gay and plays a gay character on the Fox TV series, Empire, says he received a threatening letter in January at the Chicago studios where the show is filmed, complete with a powdery substance and a crude drawing of a man hanging from a tree with a gun pointed at him. Smollett also says that the abbreviation "MAGA" — a reference to President Trump's slogan, Make America Great Again — was scrawled where the return address should have been. One week later, on Jan. 29, Smollett reported getting jumped in the early morning hours in downtown Chicago by two masked individuals hurling racist and anti-gay slurs. They physically assaulted him, according to the actor, beating him up, pouring a chemical on him and wrapping a rope around his neck before fleeing. He later checked himself into a hospital with minor injuries. At a news conference last month, Superintendent Eddie Johnson asserted that Smollett actually sent himself that threatening letter in a bid for attention. When the public reaction did not satisfy him, Johnson said, Smollett paid African-American brothers Abel and Ola Osundairo $3,500 to carry out a fake attack on him. In the proffer that was read aloud during Smollett's bond hearing, authorities said they had ample evidence — including suspicious text messages, surveillance footage and a copy of the check the actor wrote to the brothers — to support their case. The brothers themselves also implicated Smollett under police questioning. 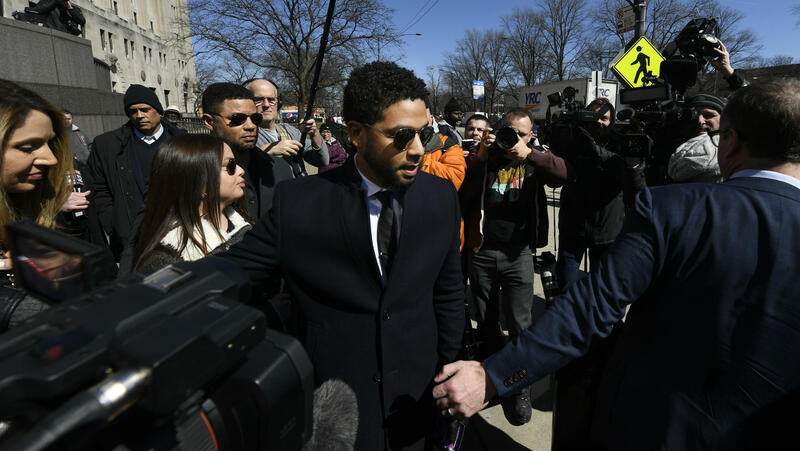 Ultimately, the allegations translated into the actor's arrest and a 16-count indictment against Smollett, returned March 7 by a Cook County grand jury. Each count was for felony disorderly conduct, each of which can carry a penalty of up to three years in prison. Smollett, for his part, has repeatedly and vehemently denied all wrongdoing. The State's Attorney's Office for Cook County, Ill. — which was responsible for prosecuting Smollett — abruptly announced Tuesday that it would not be pursuing the charges against the actor and the judge had the case file sealed. As the top prosecutors for the Chicago area, the office is well within its legal right to do so. As for why it did so, the office initially met the deluge of questions with a brief statement. "After reviewing all of the facts and circumstances of the case, including Mr. Smollet[t]'s volunteer service in the community and agreement to forfeit his [$10,000] bond to the City of Chicago, we believe this outcome is a just disposition and appropriate resolution to this case," the office explained. Later, prosecutors clarified their statement. "An alternative disposition does not mean that there were any problems or infirmities with the case or the evidence. We stand behind the Chicago Police Department's investigation and our decision to approve charges in this case," they explained, stressing that they "did not exonerate" Smollett. In fact, the first Assistant State's Attorney Joseph Magats — who took over the case after State's Attorney Kim Foxx's recusal (more on that in a second) — told ABC News that "we believe he did what he was charged with doing." "To say that he was exonerated by us or anyone is not true," he said. Typically Foxx, not Magats, leads the office, but she announced last month that she was recusing herself because of previous conversations she had had with Smollett's family. She was ready to defend the decision anyway, in a conversation Wednesday with Chicago member station WBEZ. She stressed that Smollett's case, despite his celebrity, was much like many others that came before her office: They weighed his background and his conduct against the likeliest result of pursuing the case to its conclusion. "Every single day on cases that law enforcement partners work diligently on, there are people who get similar arrangements, people who get diversion, people who get sentences that are probably not what some people would want. Every single day," Foxx told WBEZ. Later Wednesday, she told NPR's All Things Considered that the State's Attorney's Office believes that the case was sufficient to prosecute. "We cannot offer a diversion remedy to someone that we believe is not guilty." State's Attorney Foxx asserted to WBEZ that the only thing new or unique about what happened with Smollett is all of the attention it has gotten from people who have not paid attention to this kind of thing before. "I want to be clear, there is an umbrella of things that fall under alternative prosecution," Foxx told All Things Considered. "The statute does allow for people to participate in restitution. So the $10,000, which is the maximum allowed under the statute, it does allow them to do community service without having to acknowledge guilt. ... The statute allows us to choose how we want to proceed on that," Foxx said. Her office supported the argument in its clarifying statement released Tuesday. "In the last two years, the Cook County State's Attorney's Office has referred more than 5,700 cases for alternative prosecution," it said. "This is not a new or unusual practice." That opinion was not entirely shared by one of Foxx's predecessors, however. Richard A. Devine, the Cook County state's attorney from 1996 to 2008, told The Washington Post that it was particularly unusual that prosecutors appeared not to alert police to their decision before it was announced. "Going forward there are significant tensions between police and prosecutors, which is not a good thing," he told the paper, adding: "It raises some fair questions. Right now, a lot of people are very puzzled." Why are Chicago authorities upset? One important reason appears to be the one mentioned above: Chicago Police Superintendent Eddie Johnson, at a news conference held after the announcement that charges would be dropped, made clear that the move took him by surprise: "We found out about it when you all did." But he was also upset because he felt that his investigators had developed a strong case against Smollett, and that the actor was now emerging without being punished or offering apology. "If you want to say you're innocent of the situation then you take your day in court," he said. "I would never — if someone falsely accused me — I would never hide behind a brokered deal in secrecy, period." 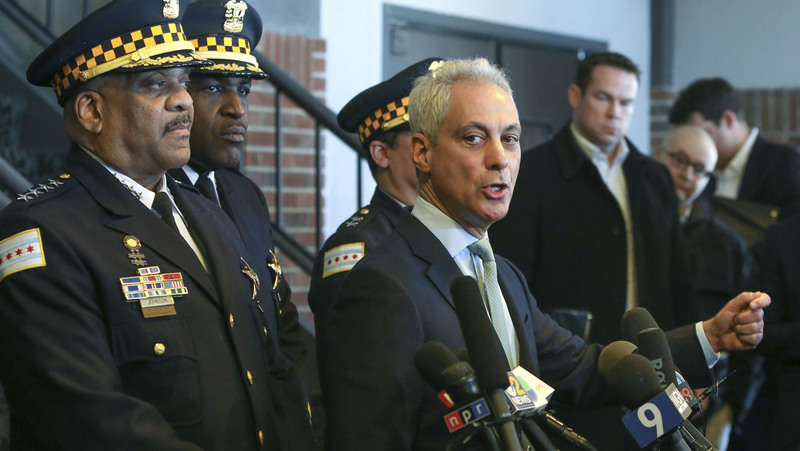 Chicago Mayor Rahm Emanuel offers a scathing critique of prosecutors' decision to drop the charges Tuesday, as Chicago Police Superintendent Eddie Johnson (far left) watches. Chicago Mayor Rahm Emanuel, who also spoke at the news conference, was much more blunt with his criticism — and based that criticism largely on the same principle State's Attorney Foxx referenced in defending the decision: the universality of the law. But unlike Foxx, who said Smollett's case was handled similarly to ones with a lower profile, Emanuel slammed the office for treating him differently. "Where is the accountability in the system? You cannot have, because of a person's position, one set of rules apply to them and another set of rules apply to everybody else," Emanuel said. "This is without a doubt a whitewash of justice," he added, "and it sends a clear message — that if you're in a position of influence and power, you'll get treated one way. Other people will be treated another way. There is no accountability then in the system. It is wrong, full stop." Foxx offered a response in her All Things Considered interview. "The rules that we have for everyone else, the 5,700 people who participated in alternative prosecutions, were the same things that we made available to Mr. Smollett," she said. "I think the question that Jussie Smollett will have to answer is: He paid the $10,000, which we consider to be restitution; he did the community service," Foxx went on to say. "But [what] will linger with him [is] whether he was — had done this ... answering for what he had done. And that will last longer than this court case or a potential court case. He will have to live with those questions in his credibility his days moving forward." The case in Cook County, focused on the alleged false police report, appears to be closed now that prosecutors have elected to drop the charges. Speaking with reporters after the court hearing Tuesday, Smollett's attorney Patricia Brown Holmes also made clear that there was to be "no deferred prosecution." That said, there is also the matter of the threatening letter. According to Fox News and ABC News, the investigation into the provenance of the letter was turned over to the FBI. ABC and local media have reported that a federal probe has proceeded despite the legal tumult at city level. Federal authorities, meanwhile, have declined to publicly comment on the matter. In any case, Chicago authorities have made clear they're not quite through with Smollett yet, even if those in Cook County are. The city's legal counsel sent a letter to Smollett's representatives Thursday demanding the payment of $130,000 — to recoup the money spent on investigating his report. Mayor Emanuel also said he'd like to see something else with that payment. "Given that he doesn't feel any sense of contrition and remorse," the mayor told reporters Thursday, "my recommendation is that when he writes the check, in the memo section, he put the words 'I'm accountable for the hoax.' "